The Ultra-ADA pads have been designed for the visually impaired to be able to feel the raised, truncated domes with their feet. 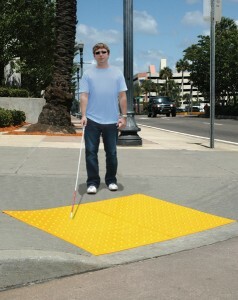 Along with the tapping cane, the truncated domes alert the visually impaired of the change in surface from the concrete sidewalk and signals that there is an intersection coming up. The flexible construction of the material forms to fit dips, slopes and inclines in sidewalks and walkways. The installation is quick and easy with the use of adhesives and anchors, and they are available in yellow, black, brick red and safety red colors. The Ultra-ADA pads also have better slip resistance and better impact resistance than composites. They are virtually unbreakable and they provide tactile warning surfaces that comply with the detectable warning on walking surfaces section of the Americans with Disabilities Act (ADA), 49 CFR 37.9.